Garden ponds create a restful environment in the home landscape, but when they clog with moss and algae they can become a source of disturbance instead. Not only are the algae and moss unattractive, but they can cause your water plants to die from a lack of resources. Homeowners can remove much of the algae by hand with a short amount of work. Once the pond is cleaner, focus on prevention. Stand at the edge of the pond and reach your rake out toward the closest string of algae. Hook the algae onto the rake tines, then drag the algae toward the edge of the pond. Lift the rake out of the pond along with the algae. Then pick the algae off the rake and dispose of it in a garbage bag. Target all long strings of algae with your rake. Work over the surface of the pond with a skimmer, such as the ones used to skim debris from swimming pools. Life out any small pieces of moss or algae you were unable to capture with the rake by using the skimmer. 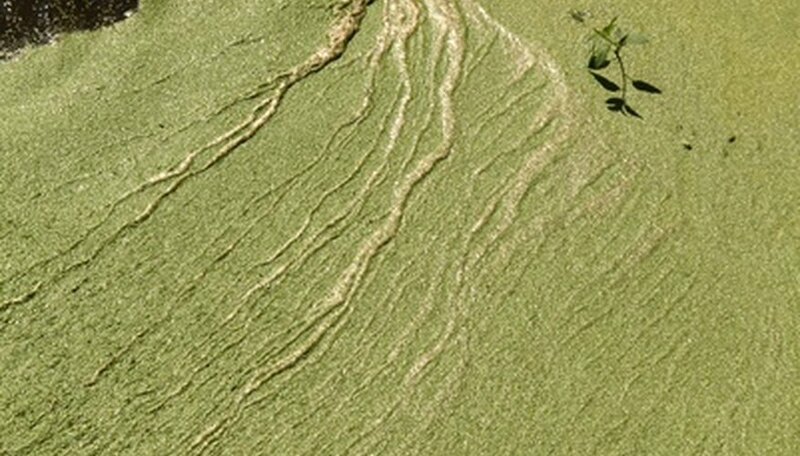 Not all pond algae are bad. Do not remove surface algae that grow on pond rocks. Install a filter to remove much of the bad algae or stock your pond with fish to naturally remove the algae.